Vangelis Roussos represents the third generation of a family tradition that dates back to 1922, 90 years ago. 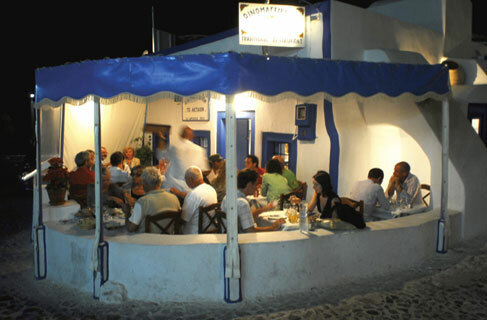 Sit at one of the few tables in the yard and particularly the ones with the view on the caldera to enjoy Greek and Santorinian dishes that are based on his mother’s and his own recipes: fava balls, pumpkin pie, local white eggplants with fava, Vinigrower’s lamb and mousakas with white eggplant. Tip: During winter V. Roussos creates sculptures in wood and pastel paintings and he exhibits his works in the interior of ‘Aktaion’.